The early 1800s was a tumultuous time below Canal Street in the downtown area of Manhattan. The Great Fire of 1835 destroyed entire neighborhoods and at least two cholera outbreaks occurred. Upwardly mobile protestants were leaving the area for safer communities up North. And, a tremendous influx of poor Catholic immigrants occurred from Ireland beginning around 1845. 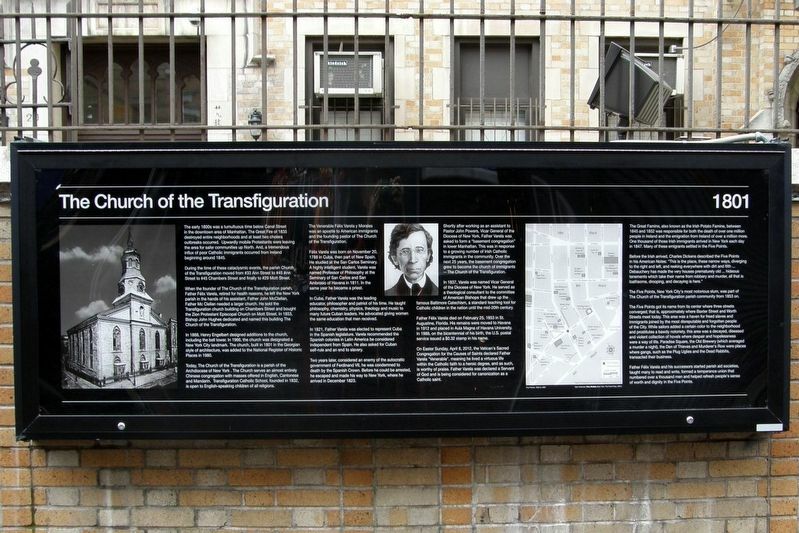 During the time of the cataclysmic events, the parish Church of the Transfiguration moved from #33 Ann Street to #45 Ann Street to #45 Chambers Street and finally to #29 Mott Street. The church school and the mandorla are in the background. Felix Varela was born on November 20. 1788 in Cuba, then part of New Spain. He studied at the San Carlos Seminary. A highly intelligent student, Varela was named Professor of Philosophy at the Seminary of San Carlos and San Ambrosio of Havana in 1811. In the same year be became a priest. In Cuba, Father Varela was the leading educator, philosopher, and patriot of his time. He taught philosophy, chemistry, physics, theology and music to many future Cuban leaders. He advocated giving women the same education that men received. 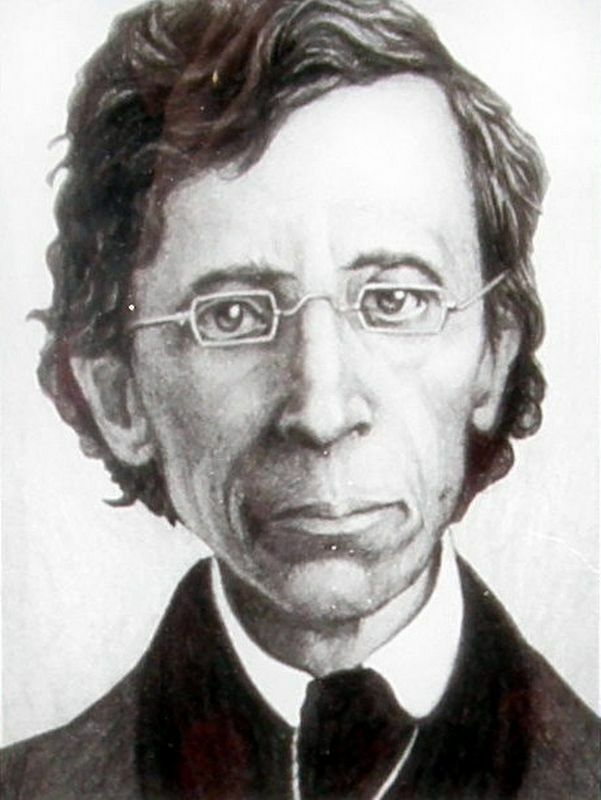 In 1821, Father Varela was elected to represent Cuba in the Spanish legislature. Varela recommended the Spanish colonies in Latin America be considered independent from Spain. he asked for Cuban self-rule and an end to slavery. Two years later, considered an enemy of the autocratic government of Ferdinand VII, he was condemned to death by the Spanish Crown. 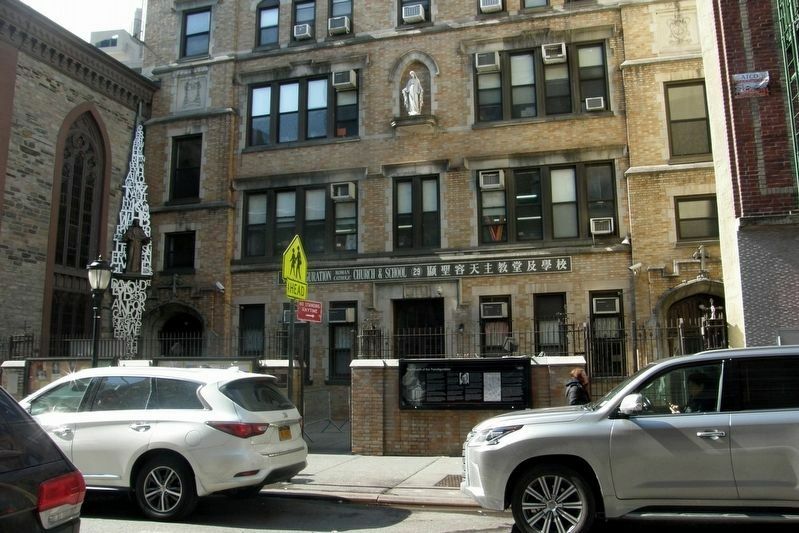 Before he could be arrested, he escaped and made his way to New York, where he arrived in December 1823.
the church of immigrants – The Church of the Transfiguration. In 1837, Varela was named Vicar General of the Diocese of New York. He served as a theological consultant to the committee of American Bishops that drew up the famous Baltimore Catechism, a standard teaching tool for Catholic children in the nation until the mid-20th century. Father Felix Varela died on February 25, 1853 in St. Augustine, Florida. His remains were moved to Havana in 1912 and placed in Aula Magna of Havana University. In 1988, on the bicentennial of his birth, the U.S. Postal Service issued a $0.32 stamp in his name. On Easter Sunday, April 8, 2012, the Vatican’s Sacred Congregation for the Causes of Saints declared Father Varela “Venerable”, meaning he had lived a virtuous life within the Catholic faith to a heroic degree, and as such, is worthy of praise. Father Varela was declared a servant of God and is being considered for a canonization as a Catholic saint. The Great Famine, also known as the Irish Potato Famine, between 1845 and 1852 was responsible for both the death of over one million people in Ireland and the emigration from Ireland of over a million more. One thousand of those Irish immigrants arrived in New York each day in 1847. Many of these emigrants settled in the Five Points. 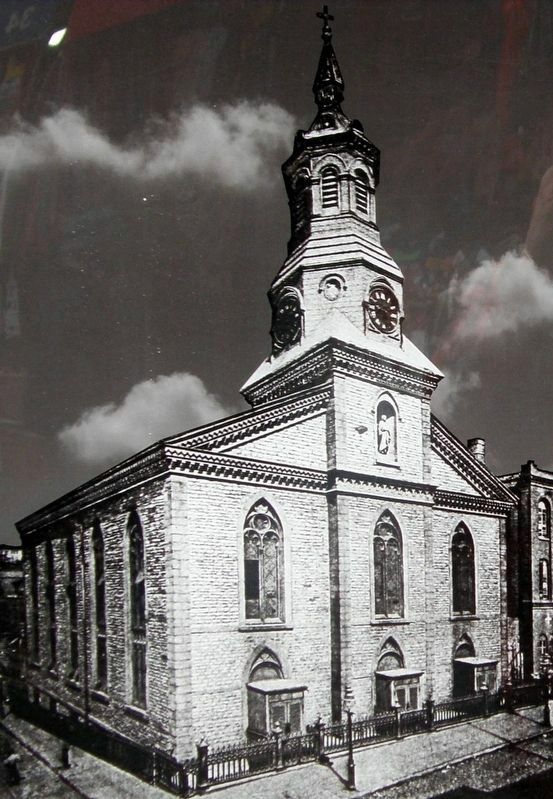 The Five Points, New York City’s most notorious slum, was part of The Church of the Transfiguration parish community from 1853 on. The Five Points got its name from its center where three streets converged; that is, approximately where Baxter Street and Worth Streets meet today. This area was a haven for freed slaves and immigrants joined by the most disreputable and forgotten people of the City. While sailors added a certain color to the neighborhood and prostitutes a bawdy notoriety, this area was a decayed, diseased and a violent collection of hovels where despair and hopelessness were a way of life. Paradise Square, the Old Brewery (which averaged a murder a night), the Den of Thieves and Murderer’s Row were places where gangs, such as the Plug Uglies and the Dead Rabbits, transacted their business. of worth and dignity in the Five Points. Erected by People of Transfiguration Parish and Fr. O’Connor. Location. 40° 42.89′ N, 73° 59.937′ W. Marker is in New York, New York, in New York County. 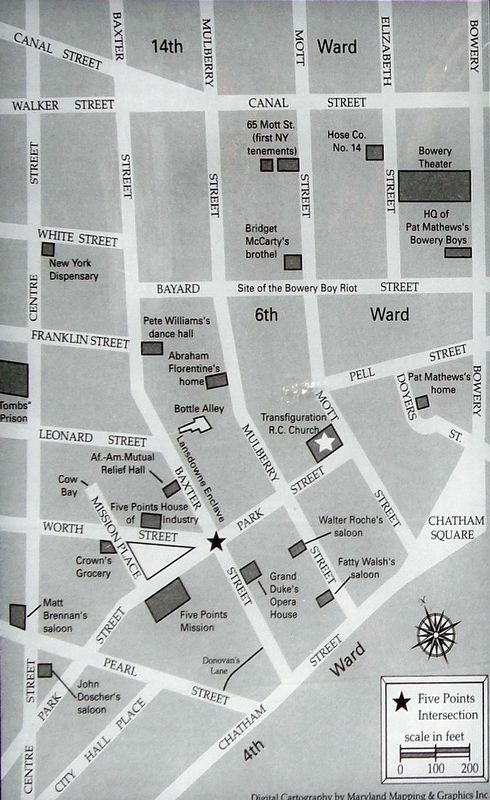 Marker is on Mott Street near Pell Street, on the right when traveling south. Touch for map. Marker is at or near this postal address: 29 Mott Street, New York NY 10013, United States of America. Touch for directions. Other nearby markers. At least 8 other markers are within walking distance of this marker. Our Father (here, next to this marker); Church of the Transfiguration (a few steps from this marker); Padre Felix Varela Morales (a few steps from this marker); Roll of Honor (within shouting distance of this marker); Welcome to Columbus Park (was about 300 feet away, measured in a direct line but has been reported missing. ); Biography of Dr. Sun Yat-sen (about 400 feet away); Gateway to Old Chinatown (about 400 feet away); Birthplace of Modern Tattooing! (about 400 feet away). Touch for a list and map of all markers in New York. More. Search the internet for The Church of the Transfiguration 1801. Credits. This page was last revised on April 8, 2019. This page originally submitted on April 4, 2019, by Larry Gertner of New York, New York. This page has been viewed 29 times since then. Photos: 1, 2, 3, 4, 5. submitted on April 4, 2019, by Larry Gertner of New York, New York. • Bill Pfingsten was the editor who published this page.